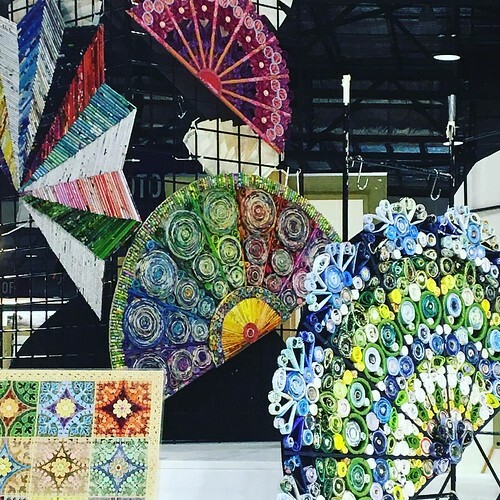 Last week's post about a quilled balalaika by Licia Politis showed just one small facet of the paper art that was featured at this year's Sydney Royal Easter Show in the Arts & Crafts Pavilion. 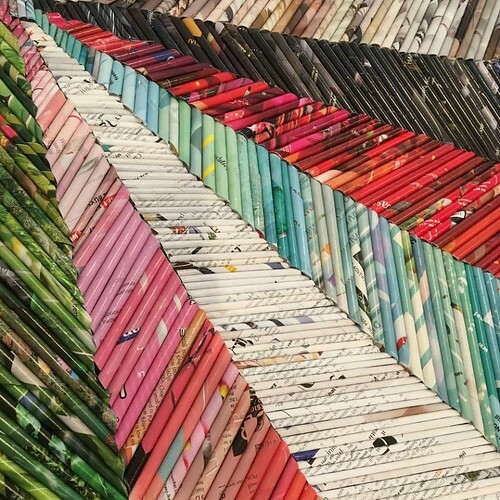 You see, before Licia began working on her individual entry, she and a team of Sydney quillers were busy creating rolled paper fans that would draw visitors to the section where paper creations were displayed. Licia and Christine Donehue devised the clever concept of large-scale fans 1 metre wide (39.4 inches) to hang on tall metal structures. 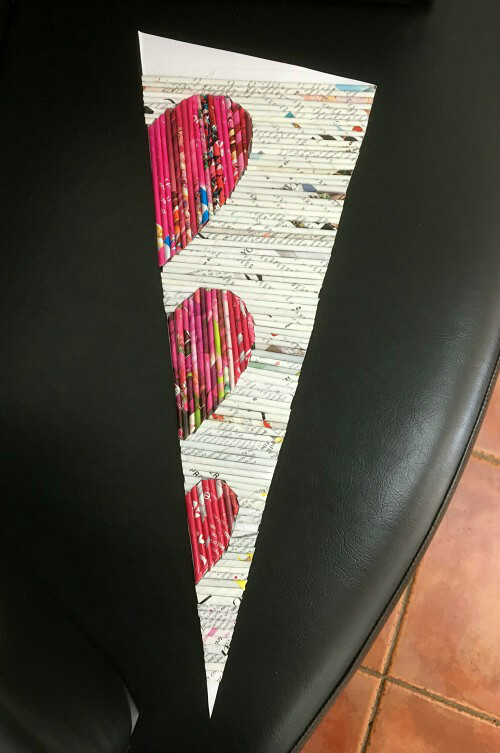 Using a magazine page spill as the design element was Christine's idea. Christine and Licia, along with Wendy Verity, each made a fan at home and then took the idea to the Sydney Quillers group (the link is to their public Facebook page where you can see more images from the Easter Show) to involve members in the making of three more abstract fans at their February meeting. 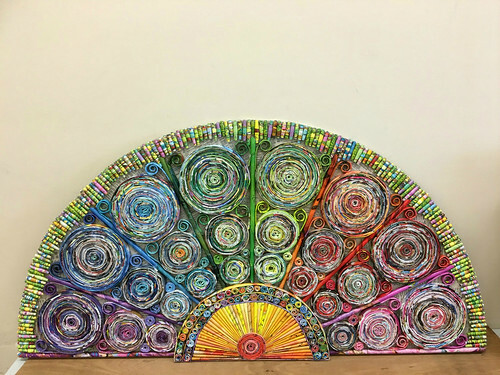 Christine had previously completed a 50 cm (20 inch) fan and it was also in the display, making a total of seven colorful attention-getters. Licia and I are often in touch and she began sending me photos of her chevron fan on February 1. At that point she had already rolled a multitude of spills and glued them in place on a half circle cardboard cut out. Lastly, the backing was cut away between the points. 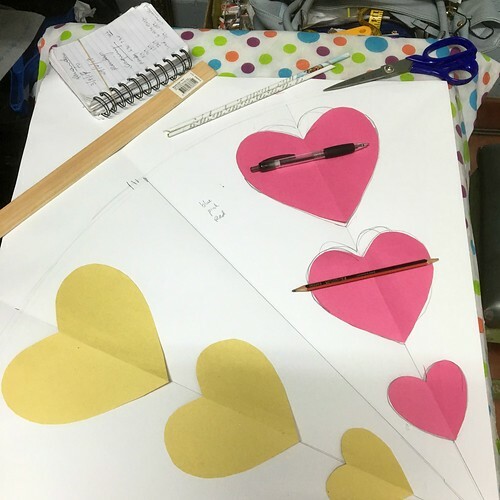 Licia finished up the fan project by the end of the month, leaving herself just a few weeks in March to design and create the balalaika. One thing I've learned about Licia over the years we've been online friends is that she regularly burns the midnight oil and accomplishes a tremendous amount in the evening hours in addition to working full-time. My hat is off to her! 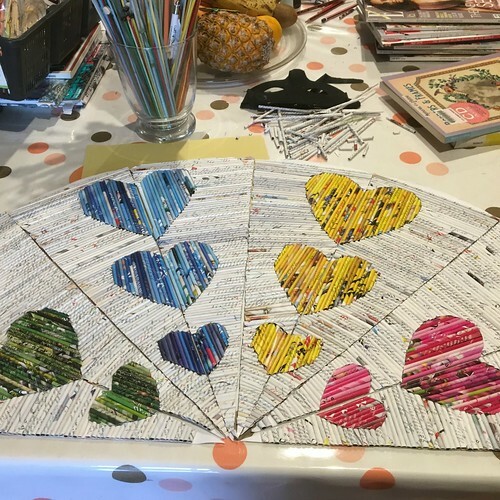 She readied an 8-segment fan for the Sydney Quillers to complete... first by drawing a diagram to help decide on the layout and then by rolling many neutral spills for the background and colored ones for the hearts so they would be ready for the members to glue in place. Licia created two of the eight segments to serve as examples at the meeting. And then completed the fan at home by assembling the sections on sturdy cardboard. 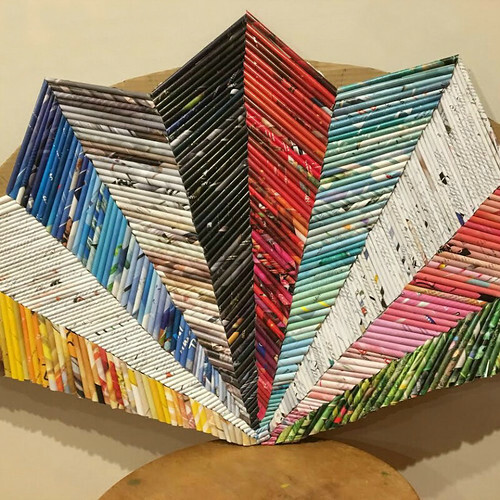 I love the way each fan is different, even though all utilize rolled spills... such a nice way to give a second life to quite a few magazines. 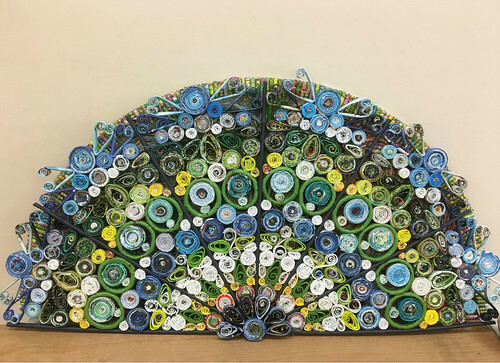 Christine's lovely fan involved rolling flattened spills into coils of graduated colors, the largest being 13 cms (5 inches) in diameter, and also hand rolling many paper beads to create segments and borders. Wendy's eye-catching filigree design was peacock-inspired. She used lots of blues with yellow and green highlights. If you're interested in learning how to make a paper spill, I posted a quick tutorial at the link. 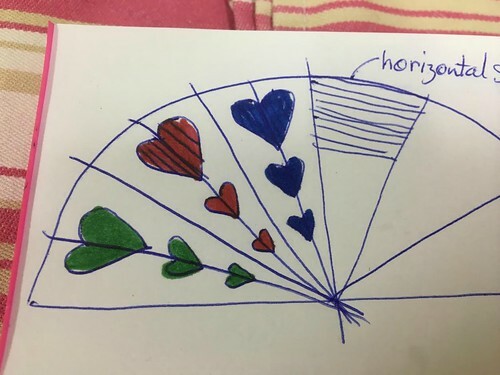 They can be quite addictive, and as you can see from the fans, useful in creating colorful patterns. Magazine page spill, interesting, had no idea was called this. 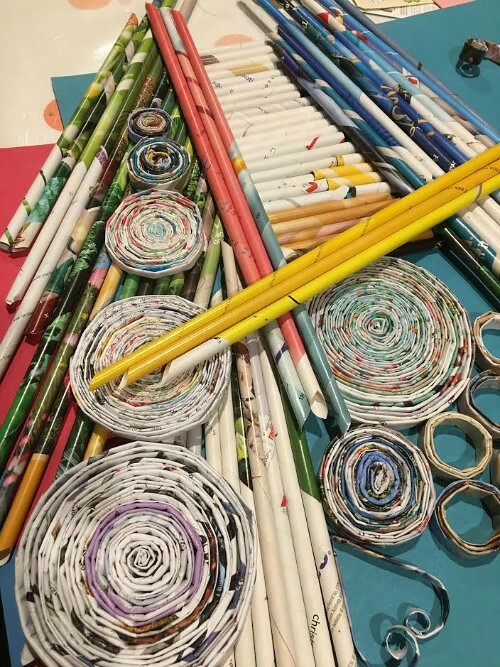 Strange, but this past weekend I started to roll newspaper pages like this in order to try making paper baskets! Now see that I can do even more with them so thank you. A timely post for me! Oh that's great, Sande! I was just looking at photos on Flickr of beautiful baskets made of spills and picture frames too. Have fun. Hi Bronwyn, I'm glad you enjoyed seeing the fans.